Even though we had some night time temperatures dip into the teens, we’ve had a mild fall season overall. The radishes seemed to do quite well under those conditions. They grew slowly but did manage to reach harvest size. 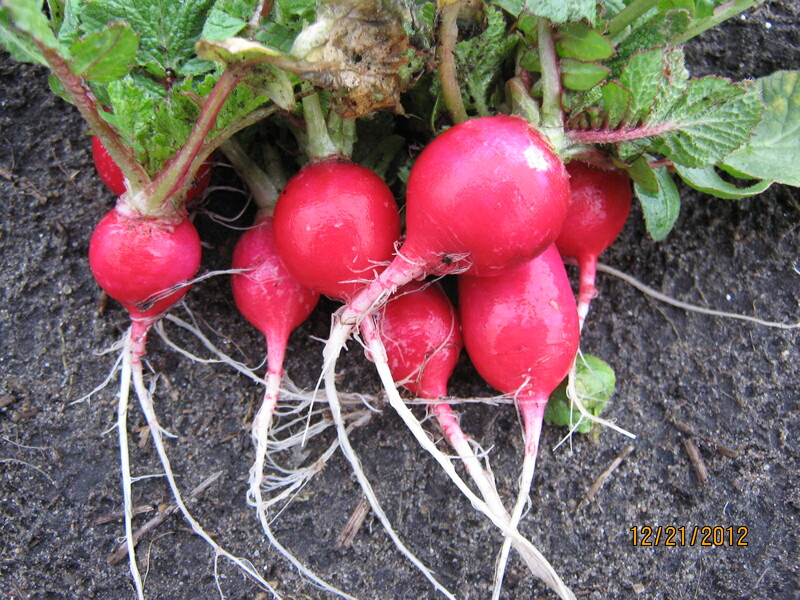 The radishes are about one inch in diameter -- big enough to eat. Sometimes it feels like I’m still gardening even though the growing season is over. 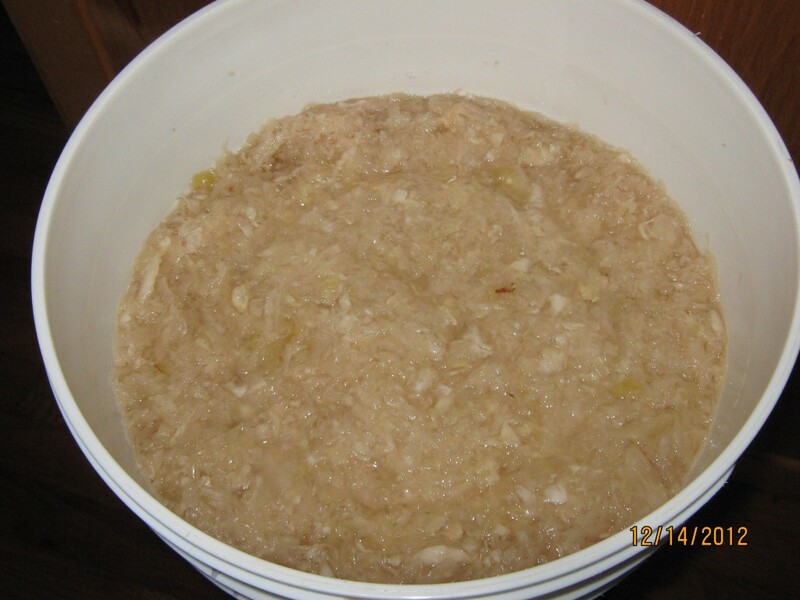 For example, I’ve been tending my batch of sauerkraut for nearly a month now. Every couple of days I check it to make sure everything’s going OK. The anaerobic bacteria that ferment the cabbage can’t tolerate air so, I need to make sure all of the cabbage is covered completely with cabbage juice. Mold likes to grow on the surfaces of the crock — or food-safe plastic pail — and the plates I use to cover the kraut. Mold has to be cleaned off as it appears. It’s sort of like removing weeds from a garden as they start to grow. The mold is not only unappetizing, but it can spoil the kraut too. Now that it has fermented for a while, I harvest a smaller layer of kraut every time I check it. If a minuscule amount of mold or aerobic bacteria try to get started there, it gets removed. Of course, I throw out any that is spoiled. It took 12 heads of cabbage from my garden to make five gallons of sauerkraut. So, I’m tending a garden that has billions and billions of probiotic bacteria and they need to be well cared for. I made my first batch of sauerkraut way back in 1978. It was so successful that I’ve continued to make it ever since. It’s something I look forward to every fall. I eat my sauerkraut raw, straight from the crock. It has a satisfying crunch and a tangy flavor that is different with each batch. Now, if I cooked it, I’d kill all of those probiotic bacteria I’ve been nurturing. By the way in my Polish family, everyone calls it kapusta, not sauerkraut. This week I’m helping a friend decide where to plant some evergreens in his yard. Now is the perfect time to make those decisions because the leaves are gone from the trees and bushes in the yard. Since evergreens keep their leaves or needles, their deep green color will stand out from the rest of the vegetation during the winter. So, it’s important to place them in the right spot. We’re trying to get a better idea how an evergreen will look in the yard space next winter and the following winters.